Former vice-president Hamid Ansari has sharply criticized donor agencies engaged in nongovernmental development work, saying that they seek to "help out" marginalizes communities with their funds, but shy away from naming Muslims as the target group, something, he insisted, needs to change. Speaking at a book release function in Delhi, he said, since large sections of Muslims are poor, they need political as also social outreach. 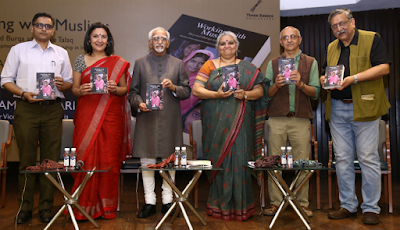 Launching the book, "Working With Muslims: Beyond Burqa and Triple Talaq", Ansari said the “years after the Sachar Report, national consensus on development agenda for Muslims is elusive", even as underscoring the need to "eschew the prevalent virus of considering Muslims with apprehension, intolerance and otherness". He added, "The Constitutional promise of equality is only achievable when development reaches the last in line." 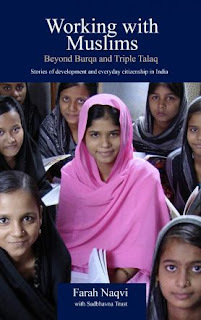 The book, authored well-known women's rights activist Farah Naqvi, seeks to focus on how civil society groups have been working with Muslim women in their context of emergence of a new, and how the young Muslim leadership is engaging itself with daily struggles for education, health, livelihoods, women's rights, while navigating the minefield of identity and issues of Muslim-ness. Suggesting that the voluntary sector's development work with the largest marginalized minority in the world's largest democracy needs to acquire a focused attention, Naqvi told the gathering at the Constitution Club, the book is a result of the post-Sachar exploration of an important link -- what are NGOs doing for the development of Muslims. She regretted, there were “mainstream” and “Muslim” NGOs on the ground, with little mutual engagement. According to Naqvi, Muslims working on the ground on issues like livelihood, education or women’s rights among Muslims need to negotiate their Muslimness. Pointing out that they try not to be seen as "stereotypically Muslim", according to her,such an attitude sometimes invites the unease of the Muslim community. She informed the gathering, many organisations did not want to be seen as working with Muslims but tried to use the flat category of poverty, though blaming it, in part, on the present political culture. She added, "Secular baggage necessitates flattening of identities". The book highlights how Muslim women are leading the way to a new articulation of issues that impact them that go beyond the rhetoric of burqa and triple talaq. It seems to suggest, 12 years after the Sachar report, the development of Muslims still struggles for basic legitimacy, wedged between the promise of the Constitution and the politics of communalism. Released against the backdrop of increasing view among scholars and activists that Muslims are being invisibilized in politics both at the level of representation and concern, the book claims to put the lens back on core, material issues of development. The book has been published by Three Essays Collective. Speaking on the occasion, prominent social activist Harsh Mander said, "At a time when the Muslim people are facing violence and social and political isolation at levels that are unprecedented since Independence, the role of civil society engagement with, by and among Muslim people is more important than ever." Political scientist, Prof Hilal Ahmed from the Centre of Developing Societies felt that the study “greatly enriched our understanding of Muslim communities, and offers us an innovative methodological suggestion: Multiple Muslim identities need to be adequately explored, if we are to make sense of the multi-layered phenomenon of backwardness and exclusion in the Indian context." While Madhavi Kuckreja of the Sadbhavna Trust said, “The study needed to start a new conversation and galvanize work at the grassroots", Gagan Sethi, a leading civil society leader, called the book, “a clarion call to secular civil society leaders to invest substantive resources in building a robust Muslim leadership specially women who lead civil initiatives as a minimum response to the systematic demonisation of the word Muslim."